Not long after Christmas a lookout above the Arataki Visitor Centre was opened. This morning, I finally paid a visit, watching the sunrise. Quite crisp, but thankfully no wind. The picture was taken about 10 minutes after the sun got up – I waited for the shadow of a distant tree to move off, and to get a bit stronger light. Let’s hope that the beautiful autumn days will stay with us a little longer! 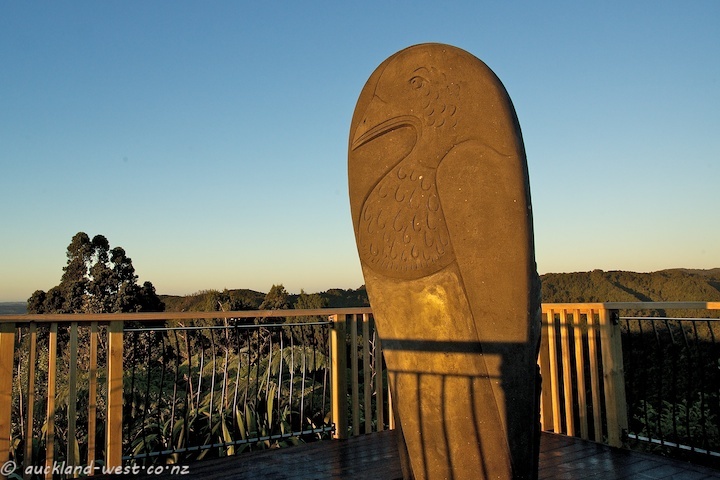 The sculpture seems to represent a New Zealand woodpigeon (kereru). There is no indication on who the artist is, but I learned from Pam at the Centre that its a carving by Pardo Jackson of Anawhata..